What is Evaporation for Thin Film Coatings? Evaporation is a form of physical vapor deposition (PVD) where material is heated to a high vapor pressure, often in molten state. The vapors are then condensed on to a substrate to form a desired thickness of a thin film. In our case, a thin film precious metal coating. The heating is typically accomplished via resistive heating or by E-beam (electron beam). Why Use Materials Engineered Specifically for Evaporation? Engineered pellets or slugs are manufactured with specific form factors intended to vaporize at known rates. Often during evaporation processes, “spitting” results in liquid droplet material splattering on to the substrate. 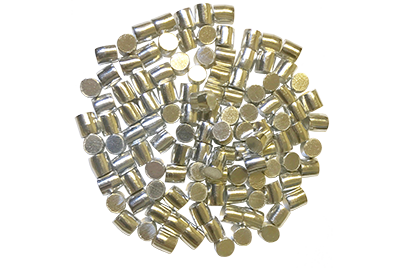 Engineered pellets are made with specified metal purities and processes intended to minimize incorporated gases and impurities to mitigate “spitting” in process. A QCM or quartz crystal microbalance is widely used to monitor deposition thickness during process. 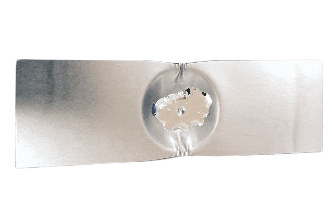 A QCM is based on a reverse piezoelectric effect such that a mechanical strain or deflection occurs when an electric field (voltage) is applied to the quartz. In the case of a QCM, the electric field is alternating in voltage, thus causing the crystal to vibrate at its resonant frequency inherent to quartz. As a thin film coating builds on the quartz crystal, its mass changes. This results in a change in the vibration or frequency of oscillation. Two additional factors come into place in order to correct the QCM. The QCM is designed to be in the chamber aside from the substrate, otherwise one or the other would shadow the deposition of the other. 1. The tooling factor is a situation or design specific factor which is a consequence of the chamber design and specifically the placement of the sensor and substrate in relation to each other. The tooling factor is a calibration of deposition rate on the sensor compared to what is actually occurring on the substrate. 2. The Z-factor, also known as z-ratio, is inherent to the material being evaporated. The Z-factor is essentially a correction factor to account for the fact that the resonant frequency and density of a particular material deposited on the quartz crystal is not the same as quartz, but rather at some ratio to quartz. Gold is the Anglo-Saxon word for the metal. It is thought to originate from the Teutonic or Germanic word for “gulth” for shining metal. The symbol Au originates from the Latin “aurom” for Aurora, the Roman goddess of dawn. Silver is a derived name from the Anglo-Saxon word “siolfur” or “seofor”, which originate from the old Germanic “silabar”. The symbol Ag abbreviates from the latin “argentum”, which traces back to the Sanskrit word, “argunas” for shining or bright. Platinum is derived from “platina”, which means little silver in Spanish. Palladium is named from the asteroid Pallas which in turn originates from Pallas, the Greek goddess of wisdom.